Stellar performances from Edward Norton and Brad Pitt make the stunning experience that is watching Fight Club. Norton plays the role of Jack, an insomniac who desperately wishes to avoid and escape his boring life that is filled with Ikea furniture. He is at his wits end and goes through a series of help groups in order to feel better about himself. He doesn't suffer from any of the problems associated with the groups that he attends (such as testicular cancer), he just finds that these groups have a perverse way of letting him sleep! When this is thwarted by the presence of another parasite like himself (Bonham Carter), Jack's nights of sleeplessness return. That is until on a plane flight, he meets Tyler Durden (Brad Pitt). Tyler sells soap for a living and after Jack's apartment blows up, he gives the soap salesman a call. Chance meeting? A night at a bar, followed by a frenzied fist fight outside and Fight Club is born. 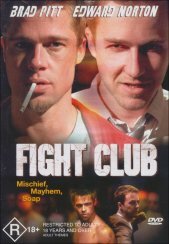 Fight Club becomes an outlet for disenfranchised men to seek an outlet through physical violence and a secret club is born. The first rule of Fight Club is: There is no such thing as Fight Club. The success of the club spreads with unexpected results that will send Jack into a nightmare world that it seems that he cannot escape from. Fight Club is over the top, naturally with David Finch at the Helm, the performances by our lead actors make the film an intense experience that will have you biting your nails until the shocking end. For some people, the violence in the movie will be off putting or upsetting, however it is not excessive considering what the movie is about. I don't believe that it truly deserved the R rating it received. Fight Club would rate as one of the best movies I have seen ever and be in my top 20 movies. It is also available as a collector's edition DVD but I could not see the point in the extra expenditure.